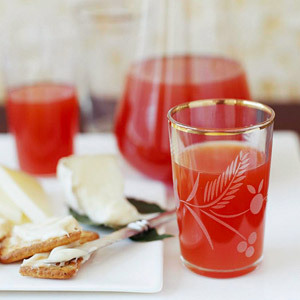 Apple cider, orange and lemon juices, mixed with a sparkling wine makes a refreshing drink with dinner. In punch bowl, large pitcher, or pitchers combine apple cider, orange juice, and lemon juice. Slowly add sparkling white grape juice or sparkling wine. Serve immediately. Makes 11-1/2 cups (about 15, 6-ounce servings).